Description: The most famous and popular of Floyd’s operas is his third, Susannah, premiered in 1955 and the second most performed of all American operas. 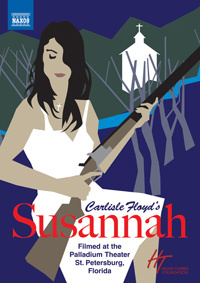 Updated and set in Tennessee, it is loosely based on the Apocryphal tale of Susannah and the Elders. The work is rooted in vernacular folk melodies and hymns and contains soaring melodic beauty. Susan Hellman Spatafora (soprano), Scott Wichael, Anthony Wright Webb (tenors), Todd Donovan (baritone), St. Petersburg Opera Orchestra and Chorus; Mark Sforzini. 16:9 widescreen. PCM stereo. NTSC all regions. 105:35.